At New England Equine Medical and Surgical Center, we periodically have foals admitted to our clinic that require intensive care. 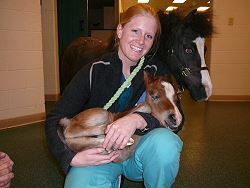 Sometimes these foals require around-the-clock care and we rely on volunteers to help us with these cases. The primary responsibility of a foal watch volunteer is to stay with the foal and monitor its general well-being while a trained technician or veterinarian supervises its medical care. This is a very rewarding and educational opportunity as you will gain a lot of foal care knowledge and experience during these cases [foal watch application form]. We are looking for horse-loving people who have an interest in foal care and are over the age of 18. 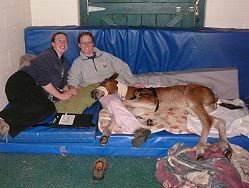 Prior to volunteering with a foal, you will have sufficient training to learn your responsibilities. Please be aware that most of these foals require 24 hour care so while we will obviously work with your schedule, we are looking for people with some flexibility as well. If you are interested, please feel free to contact our Foal Watch Coordinator Aurora Sochan by email extern@newenglandequine.com or call (603)749-9111.